The Vision has always wanted to be human. It’s kind of his whole “thing.” This week, he tries again—harder than he ever has before—by setting up shop out in the suburbs with a synthezoid wife and children. “Even an android can cry.” It’s the signature line from the classic Avengers issue when the Vision is allowed to join the team. Turns out androids can argue with their spouses, get teased in high school, and wonder if the President’s going to give them a steady job, too. 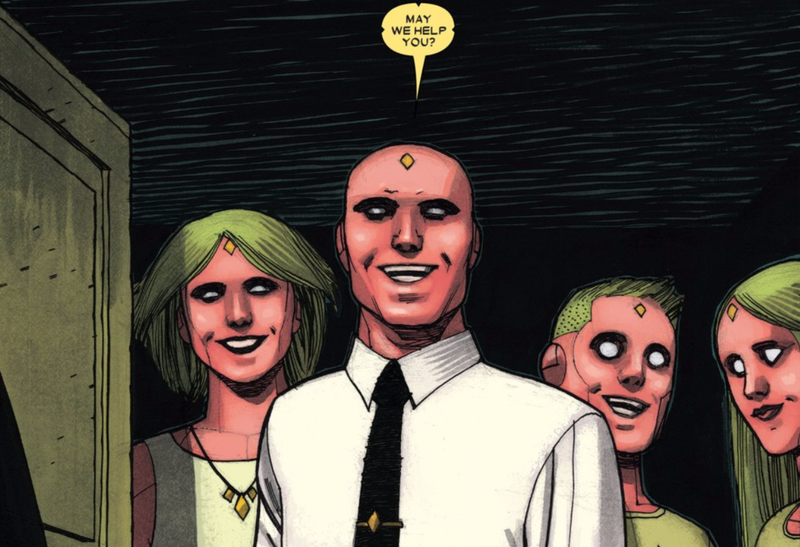 All of that happens in Vision #1, written by Tom King, with art by Gabriel Hernandez Walta, Jordie Bellaire and Clayton Cowles. ... things can get weird. Then, a chilling bit of foreshadowing. King’s writing is rich with small details that make up a humdrum cul-de-sac existence. Even the arrival of super-android neighbors hasn’t changed things up that much. Walta’s artwork homes in well on precise moments of dread and elation and Bellaire’s colors impart a warm coziness to the proceedings. The Vision and his family aren’t immune to the stresses of grown-up life. Due to changes to Tony Stark’s bank account, The Avengers aren’t paying their members anymore. The Vision’s worrying about money while his wife Virginia frets over the kids possibly messing up their go-intangible-with you clothes on the first day of school. This is a superhero comic, however, so those more mundane worries go sideways when a threat from the Avengers’ past comes crashing into town while the Vision’s away . Vivian reacts like most mothers would—ferociously protecting her family—but in a way that threatens to open up a world of problems for a robot family trying to blend in. Just one issue in, King and company are setting up an exploration of humanity, suggesting that even machines can fall prey to the kind of suppressed rage and existential anomie that can haunt the rest of us. The Vision has tried to be a ‘regular person’ in the past, usually with unfortunate results. The question that this new series will hopefully explore is: why? Why does he keep trying? Based on the first issue, the answers should be interesting, or at the very least, creepily entertaining.